The motorship Malabar, Port of Registry, London, Official Number 148681, of 4,512 tons gross register, George William Leslie, Master, left Melbourne on 31 March 1931 with a complement of 109 officers and crew and 28 passengers, on a voyage to Singapore, with Sydney, New South Wales, as the first port of call. 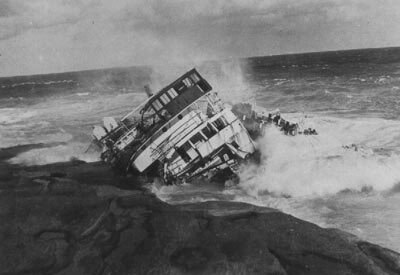 So began the statement of the case against George Leslie over the stranding and subsequent total wrecking of the MV Malabar in Long Bay, Sydney. A Court of Marine Inquiry was held in Sydney on 15 and 16 April 1931 before John Laidlaw, Esq., Chief Stipendiary Magistrate of NSW, at which Captain Leslie was charged with failure of duty in a matter relating to the navigation of the Malabar. The story of the wrecking of the Malabar really begins in the early 1920s when the economic advantages of the motorship over the steamship became more obvious. The increased cargo capacity caused by the absence of coal bunkers alone was enough to justify shipowners to bring into service diesel powered motorships. The Australian shipping line Burns, Philp & Company Limited placed an order in 1924 for such a vessel, its first, to replace the Montoro on the Java to Singapore run. The new vessel was launched from the West shipbuilding yard of Barclay, Curle and Company, Scotstoun, Glasgow, Scotland on 9 July 1925. The ship was named the MV Malabar after a small town in Java about 32 kilometres south-west of Bandung. An interesting note, the names of virtually all the ships of Burns Philp were seven letters long and started with the letter M! The length of the Malabar was 350 feet 0 inches, breadth 48 feet 6 inches and depth 25 feet 3 inches (to the upper deck) and the gross tonnage was 4,512 tons. Power was supplied by a single acting 2,700 horsepower eight cylinder Burmeister & Wain type four stroke blast injection diesel engine (diameter 750 mm, stroke 1500 mm) constructed by John G. Kincaid and Company Limited, which drove a single screw. The engine was the second completed by Kincaid and it gave the Malabar a top speed of 13.2 knots. The engine was fitted with an air injection system that utilised exhaust gas driving a turbine and air from compressors. There were also four Allen auxilary generating sets, each run by a three cylinder diesel engine. A Clarkson marine waste auxiliary exhaust gas boiler was installed as part of the funnel and a small steam engine placed in the engine room for domestic purposes. There was also another boiler, a Cochran. The auxilary boiler was oil fired when the main engine exhaust was not available. It was the first ship to be such equipped. Today the funnel and exhaust boiler is located a short distance away on the other side of Long Bay, see Tupia Point page. See later comment about the steam engine's location. Accommodation was provided for 156 passengers in one, two and four berth cabins. There were five cargo holds as well as insulated holds for carrying fruit and frozen meat. The total cargo capacity of the Malabar was 202,920 cubic feet. Six hundred and two tons of oil could be carried in the two oil bunkers and the double bottom tank. As can be seen from these figures, the Malabar was a fairly substantial ship. During trials in the Firth of Clyde in October 1925, the Malabar rammed the Wemyss Bay railway pier when the steering failed. This was an ominous sign of things to come. 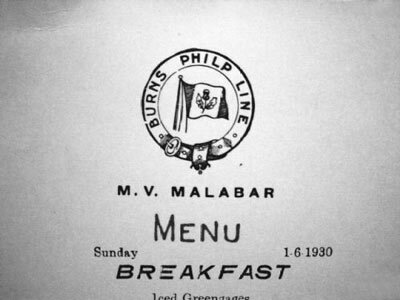 On 10 October 1925 the Malabar was taken over by Burns Philp's London Branch and left Avonmouth on 17 October 1925 for Australia via Colombo (Sri Lanka) and Singapore. She was carrying 2,188 tons of cargo as well as 17 passengers. The Malabar arrived in Sydney on 17 December 1925 on its maiden voyage. It was the pioneer motorship to operate on the east coast of Australia and became the second motorship in Australia. 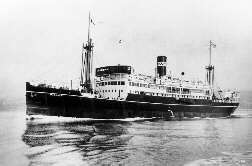 The first voyage of the Malabar on the Singapore run commenced from Sydney on 2 January 1926 with a full load of cargo and a large number of passengers. The voyage was via Brisbane, Townsville, Thursday Island, Darwin, Sourabaya, Smarang and Batavia (Djakarta) on Java, now part of Indonesia. 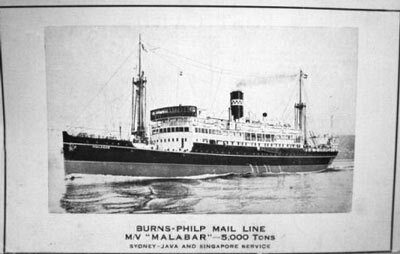 The Malabar's regular service was from Singapore to Melbourne via the above ports, with a visit to Port Moresby in New Guinea once every three to four months. The crew of the Malabar was a varied lot. 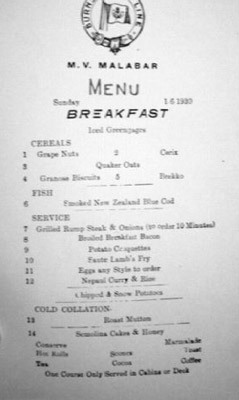 The cooks were Chinese, the cleaners and engine room staff Indian, the deck hands Malay and the officers, of course, whites. On 3 March 1926, Captain L. L. Wrathall, Chief Geologist and Field Superintendent of the Timor Petroleum Company Limited sailed from Sydney on the Malabar with a team of drillers and 50 tons of equipment. They were bound for Dilly (now Dilli), Timor. They were to put down a bore to capture the oil and gas that were escaping from the ground. In early August 1926 seven members of the Japanese Parliament travelled to Australia on the Malabar. They travelled via Darwin, Townsville, Brisbane, Sydney and Melbourne. In September 1926 the Malabar attempted to tow the stranded British tramp steamer Rio Claro off Scott Reef, about 48 kilometres south east of Cairns but was unsuccessful. 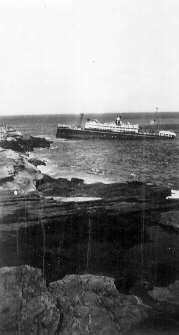 The Rio Claro was still aground when the Malabar passed by on its return trip and remained there for 39 days before being refloated. On Tuesday 27 April 1926, a party of Customs officers raided the Malabar in Sydney Harbour and found 100 tins of opium. These were concealed in egg containers in the galley. The Chinese crew denied all knowledge of the drugs. 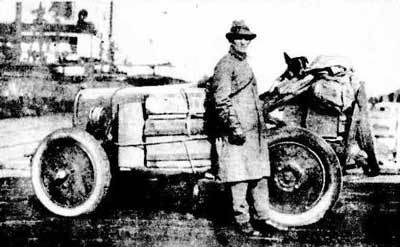 In August 1926, Francis Birtles drove an Oldsmobile from Melbourne to Darwin in a record nine days. He and his car were transported back to Melbourne on the Malabar, arriving on Thursday 26 August 1926. 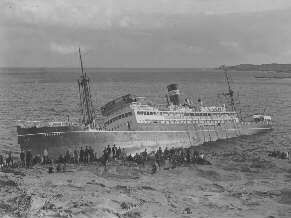 In May 1927 the Malabar was delayed when she stood by the SS Tasman which was stranded on a reef "the other side of Thursday Island". On about Saturday 17 September 1927, a "Chinaman", See Choon, a member of the crew of the Malabar, was apprehended on the ship with 24 painted finches which he was trying to smuggle out of Austgralia. He had concealed them in a pair of lady's bloomers under his own clothes. One of the finches was dead. It was stated that the finches were worth £10 to £15 a pair in the East. He had to make a deposit of £10 to cover any fine that may be imposed. On Monday 14 May 1928, Ismail Bin Osman, a Malay, seaman on the Malabar was charged with attempting to smuggle opium into Darwin. Evidence was given that Osman evaded the Customs' watcher by crawling along under the wharf. He was seen by Constable Don who gave chase and catching the man took him back to the Customs Shed to be searched. It was found that he had 12 tins of opium secreted in a belt and was arrested. He was sentenced, to 12 months imprisonment with hard labour. In February 1929 Burns Philp came to an agreement for a five year mail contract for the Pacific Islands with the Australian Government. This took effect in April 1929. As part of the agreement, the company agreed to build a new vessel for the Singapore run within three years and planned to move the MV Malabar to the Sydney to Rabaul (in then New Guinea) run. However, before this new vessel (MV Macdhui - to be later sunk by Japanese planes in Port Moresby Harbour) came into service on May 1931, an accident to the Malabar would change the company's plans. On Monday 6 May 1929, Customs authorities raided the Malabar in Sydney looking for 360 tins of Lum Kee No 1 Opium that was believed to be on board. The search was organised by F. C. Bragg, Principal Boarding Inspector of Customs and the opium was said to be worth £7,000. It was not found. On Friday 9 November 1928, the Malabar departed Brisbane for Darwin. She carried with her Captain R. S. Taylor, the Brisbane based Lloyd's surveyor, Mr Snellgrove, the engineer superintendent for Burns Philp and Company and Mr Heron representing the London Salvage Association. They were bound for the the Tango Maru which was stranded on a reef near Thursday Island. The ship also had a large number of steel plates for repairing the hull of the Tango Maru. Apart from the Rio Claro incident, the Malabar had an incident-free life for the first five years of its life and proved to be a very successful and economic purchase. It was the practice for Burns, Philp ships on the Singapore run to relieve certain members of the crew at Sydney on the south bound voyage. The relief crew would take the ship to Melbourne and back to Sydney. Captain George Leslie often relieved the regular master of the Malabar on these occasions. On Thursday 12 March 1931, the Malabar called into Darwin for the last time. The majority of passengers on board were Americans, on a tour of the World. She headed south with other passengers who went on board there. On 31 March 1931, the MV Malabar, under the command of Captain Leslie, set sail from Melbourne for the regular trip to Singapore. This was to be her 32nd trip. 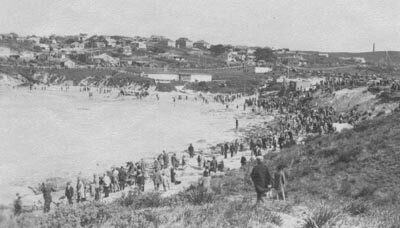 At about 6.35 am on 2 April 1931, the Malabar passed Cape Baily near Cronulla, about 25 kilometres south of Sydney Harbour. Its course was 18° magnetic and the Cape was three-quarters of a mile distant. At about 6.45 am it was one mile abeam of Cape Banks, the northern headland of Botany Bay. The weather became hazy and the course of the Malabar was said to have been altered to 23 degrees magnetic. Shortly after the vessel entered a dense fog and at 6.52 am it ran aground on the northern side of Long Bay, about 14 kilometres south of the Harbour. Photographs taken later that day show the seas to be absolutely millpond, although reports in the Sydney Morning Herald the next day state that at high tide the swell became more pronounced. I have recently (early 2004) came across some photos taken on the ship after it had hit the rocks. These clearly show that there was quite a lot of fog around. 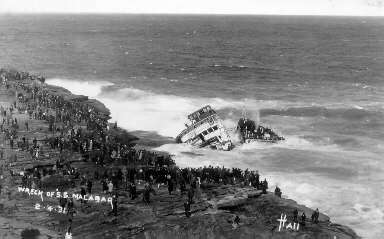 The Malabar hit the rocks about 50 metres inside the northern headland of Long Bay and Captain Leslie immediately put the ship full speed astern but the Malabar was well and truly stuck on the rocks. Captain Leslie stopped the engines and ordered the evacuation of the ship. All the passengers and the Chinese and Malay crew members (there were 63 Chinese and 26 Malays among the 108 crew) were put ashore by lifeboats within half an hour. Three valuable stud horses being shipped from Melbourne to Darwin were swum ashore. The trawler Charlie Cam (which itself was to sink on the South Coast of NSW only a few months later) came on the scene about 10 am and attempted to tow the Malabar off the rocks but the line gave way. The tug St Aristell was made ready to attempt salvage but it was too late and no further attempts were made. The only life lost was that of the ship's cat which refused to leave the stricken vessel. The Captain, three officers and the doctor stayed aboard the Malabar until noon and then they stood by in a small boat until 1.30 pm when it had developed a critical list to starboard. The ship was filling up and submerging aft. "There were two principal places of amusement (in Sydney) on the Good Friday holiday - the (Royal Easter) Show and the Malabar - and it appeared that everyone went to both" said the Sydney Morning Herald on 4 April 1931. The newspapers of the day state that huge crowds of people came out to see the new wreck and photographs of the complete ship show people all over the headland and rock platform. The Daily Telegraph and the Herald reported that on 4 April, Good Friday, 150,000 people visited the site of the wreck. The ship had completely broken up earlier that day in heavy seas and the cargo was washed into the sea. 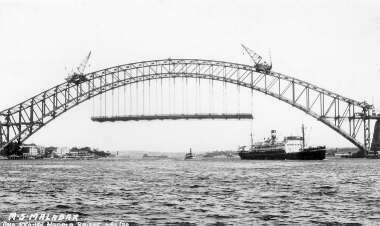 The newspaper reports tell stories of people salvaging goods from the coastline between Sydney and Newcastle and even in Sydney Harbour. The Herald reported some young men who risked their lives to get a keg of beer out of the sea near the wreck. I have also read of one person who salvaged some timbers and made a small chair for his son. This chair is still in the family in 2015 and has been used by five generations. 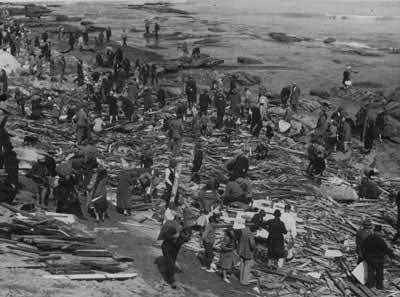 The crowds continued to visit the wreck over the Easter weekend, with the Telegraph estimating on 7 April that 500,000 people had visited so far. People set up booths selling fruit, sandwiches and soft drinks. Photographers sold photos of the wreck and musicians busked. Thirty police were on duty keeping the crowd in order, together with another eight traffic police who controlled the cars. On 5 April a snake charmer, George Aither of Surry Hills, was bitten on the hand by one of his snakes while performing at the wreck site. He was taken to the nearby Coast (Prince Henry) Hospital where he was treated and later released. On 6 April two men were arrested after stealing the ship's compass. Bruce William Tilley appeared in Central Police Court on 20 April charged with stealing the compass, value £90 and was released on £30 bail. It was not reported what happened to the accomplice or what was the outcome of the case against Tilley. Another very interesting story concerns the crew of the ship. Apparently some of the Chinese crew were smuggling opium into Australia. The Police had learnt of this and were waiting at the wharf for them. When news came of the stranding, they rushed to Long Bay. Here they followed one of the Chinese crew and 10 days later, on 12 April 1931, the Police raided a Dixon Street (Chinatown) opium den. Here they smashed down a brick wall and found 16 cans of opium. Among the Chinese arrested were three of the Malabar's crew. It is not reported what happened to them. 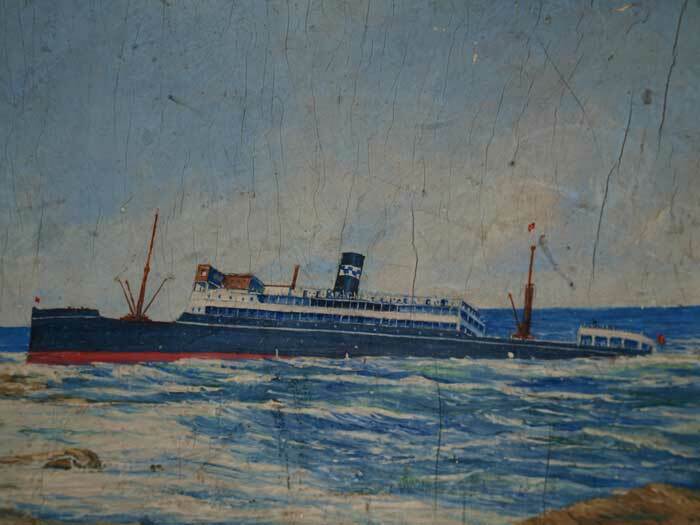 The wreck was sold for £140 and the cargo for £41 to the Penguin Salvage Co. on 7 April 1931. It is interesting to note that the wreck of the SS Minmi was purchased by Penguin Ltd in 1937 and the hulk of the Meggol (ex HMAS Doomba) in 1947. Salvage started on 8 April and the binnacle stand, some furniture and basins were removed but work was suspended on 9 April due to heavy seas. 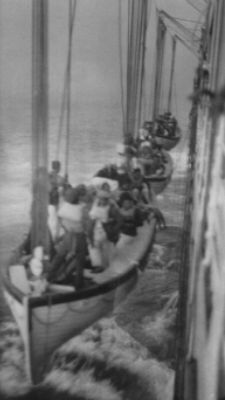 The ship's Union Jack flag and bosun's store were rescued on 10 April. The Sydney Morning Herald reported on 16 April that a diver was in extreme peril on the sea floor at Long Bay the previous day. Some fishermen had secured a diving suit and were searching for goods when the safety line was lost and the diver "walked helplessly about the bay". Eventually he removed his weighted boots and shot feet first to the surface. He was not injured. After these salvage attempts, the wreck lay basically untouched for over 25 years until the introduction of scuba. In the late 1950s and early 1960s some of the pioneer divers in the Sydney area dived on the wreck and salvaged the valuable metal items that remained. Barry May blew the remains up in his attempt to salvage remains. Together with John Bissett, he salvaged the prop sometime prior to 1962. This was 15 foot 6 inches across and had to be broken up before they could move it. The total weight was estimated at six tons, all bronze!! The boss alone was 2.5 tons. Valuable momentos were also taken during this time. 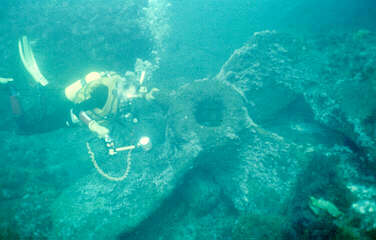 The main bell was taken in 1961 by Sydney diver Jon Jacobs when he was doing salvaging work on the Sydney shipwrecks. It is (as far as I know in 2000) still owned by him. 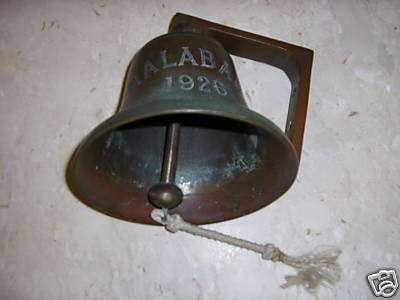 Another smaller bell was also recovered during the salvage in the days after the sinking. I think that this was a bell that was attached to one of the forward masts. It was purchased by the father of Richmond farmer Bob Power at a sale of items salvaged from the wreck. 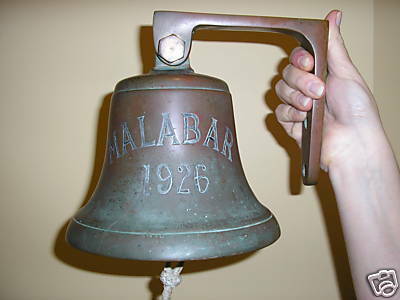 Inscribed "Malabar 1926", it was passed on to Mr Power but was stolen in late 1990 from the veranda of his farmhouse. This must have been installed after the ship arrived in Australia. Until May 2008, I had a request on this page that if you came across this bell to contact the Police. Guess what? 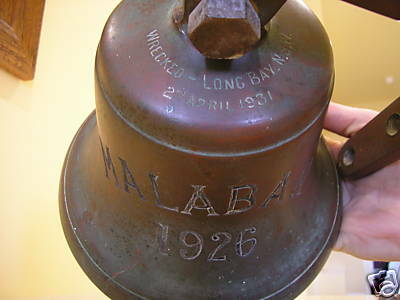 On Saturday 4 April 2008, a person in Narre Warren, Victoria, had a bell inscribed "Malabar, 1926" for sale for $500 starting bid or a buy now price of $1,000. When asked how he came across it, he claimed that it was puchased as part of a load of scrap in 1987 from a garage sale at Balwyn. Later that day, the bell was removed from sale. Below are the photos of the bell from Ebay. Looks like me to be the missing bell and also a guilty conscience to remove it from sale so quickly. On 5 May 2008 I reported this to NSW Police, hopefully they will get the Victorian Police to investigate and get the bell back to the rightful owner (I tried to find him but no luck). I also understand that someone else may have informed the Victorian Police. In about 1964 John Cann (who with his brother and father ran the La Perouse snake show for over 80 years) salvaged one of the anchors of the Malabar On the actual day of salvage, he was assisted by Arthur Strange, Harry Murphy and Les McKenzie and using rigging designed by John Cann, they got the to the shore. It is now located out front of Malabar RSL (now called Juniors at Malabar). 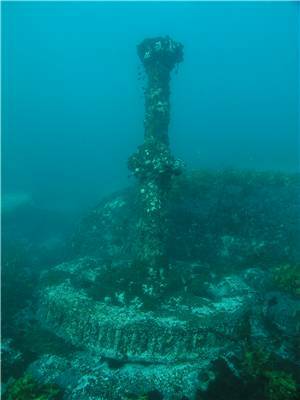 The relatively shallow depth that the wreck is in and the fact that the site is totally open to the worst seas that afflict Sydney have meant, together with May's efforts, that the hull, deck and superstructure of the Malabar are now nothing but rusted and twisted pieces of metal. However, this does not mean that the wreck is not worth visiting. Then, just when scuba diving became more available to the general public, the site became virtually inaccessible to divers. Unfortunately, the Malabar happened to be not only located right next to Sydney's largest sewage treatment plant, but within metres of the ocean outfall. This meant that the (basically) untreated sewage was being dumped straight into the sea next to the wreck. 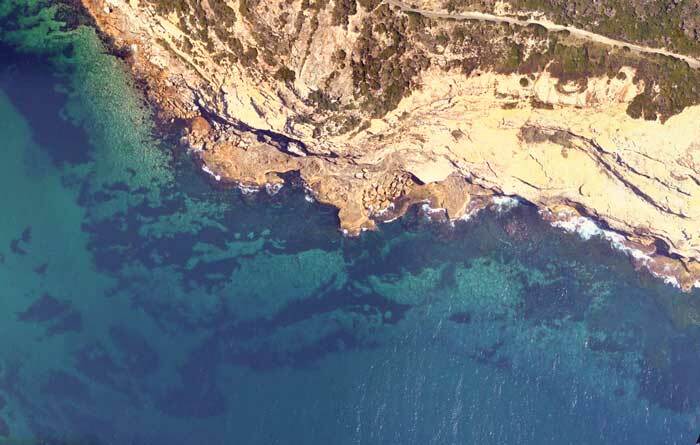 Not only did it make the wreck site undiveable, but it affected Long Bay to such an extent that the NSW Health Department and Randwick Council closed Malabar Beach and a nearby ocean pool in the mid-1960s ago because of the extreme pollution. On 22 September 1990, the Malabar Sewage Treatment Plant deep-water ocean outfall system was activated. The opening of this outfall, the first of three under construction for Sydney's major sewage treatment plants, marked the beginning of the end of a 202 year policy of dumping sewage directly into the water off Sydney's shoreline. The new outfall deposits the partially treated sewage 3 to 4 kilometres off-shore in deep water. It also represented the first stage in a long term upgrading strategy for the disposal of sewage in Sydney. As simple as this change was, it produced immediate results. Within hours of being switched on, the water around the old outfall at Yellow Rock was dramatically clearer. After having lived near the sewage treatment plant nearly all my life, it was apparent to me within one day that the water quality in the ocean and adjacent Long Bay had improved to such a degree that swimming and diving would be a healthy pursuit to undertake in the bay. On 5 October 1990, the first occasion we had after the new outlet was operating, my brother Stephen and I decided to find the wreck of the MV Malabar which we knew was located very close to the old outfall. This dive site had long been known to us, but because of the pollution we did not know of anyone who had dived there. The first dive was basically an exploratory one, as we were not all that sure of the exact location of the main part of the wreck. We found large sections of a wreck scattered all over the northern edge of Long Bay. Most of this I now know to be from the wreck of the SS Goolgwai but some is certainly from the Malabar. Our next dive a few days later showed us even more pieces of the wreck including the anchor, rudder, davits and capstans. After interesting other friends with our tales of what we had found, including the number and size of fish (Yellow Rock was prior to the new outlet's opening Sydney's best and most dangerous rock-fishing spot), we dived again and found not only the driveshaft, bollards, a large propeller and the engine as well as other large but unidentifiable pieces of wreck. A few more dives enabled me to roughly map the dive site. The major pieces of the Malabar were found in only 9 to 10 metres of water. At this time there was very little kelp covering the rocks in this area and the sponge and other fixed marine life was very sick looking and slimy. All of the above dives were done as shore dives as at that time there were no dive boats yet visiting the site. This soon changed as word spread of how good the site was. A number of dive boats started to irregularly dive this site. The Malabar is an easy wreck to find and the marks and my GPS readings will bring you right over the wreck. The GPS reading for the Malabar is 33� 58' 13" S 151� 15' 43" E. Note that all the GPS Readings on my Web Site are taken using AUS66 as the map datum. If you use another datum you may be about 220 metres off the wreck. See my GPS Page for more details and how to convert readings. For boat diving you should line up the spire of St Andrew's Catholic Church, Malabar, over the edge of the rock platform and the large chimney with the headland. This should put you near the main part of the wreck. See GPS and Marks Page for more details. For a map of the Malabar, click here (note the scale of land to the underwater is out - shrink the underwater section by half). To dive the Malabar from the shore, drive to the far end of Fishermans Road, Malabar, and park in the rough car-park above the boat ramp. 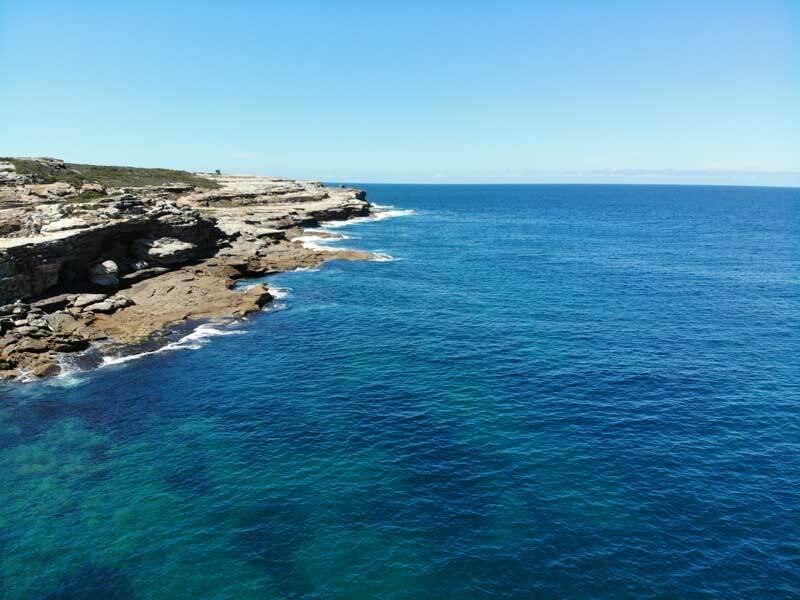 Gear up and walk along the rock platform right out to the point and then around to the east. This is a long walk and should not be attempted by the unfit or in hot weather. There is an excellent entry point off the southern most rock just around the point. Snorkel out to the south-east for 30 metres and submerge. You should find pieces of wreckage almost immediately. Drop to about nine metres and then head in an east to north-east direction and the wreckage should get denser. When you find the rudder , look carefully in this area. I found a section of the bronze prop here in 2004, it obviously broke off the prop when wrecked or when it was salvaged. There is also an anchor in this area and a urinal together with two large bollards. Continue further on in the same direction. Only 5 to 10 metres further on you should see sections of the drive shaft that once connected the engine to the propeller. Some sections are lying separate from each other but four sections are still connected together by huge bolts at the flanged ends. Part of this larger section has two big rocks lying on it and another has a huge rock almost completely covering it. If you follow the driveshaft to the north and progress on past the end in the same direction you will firstly come to a large object. I believe that this is the auxilary steam engine that was used to provide power for electricity. Follow the low wall to the north-east and about 20 metres further on is the engine. This consists of the pistons, conrods, crankshaft and bearings within its housing. This impressive structure is basically lying on its side and you can swim in, around and under the whole engine. The eight cylinders are mostly still in place, although some have broken away from the main structure. Large numbers of blackfish and bream can be seen within its components. Note that in late July 2001 it suffered considerable damage from a storm (see later). Just at the south-west end of the engine is a large propeller which has one blade missing. 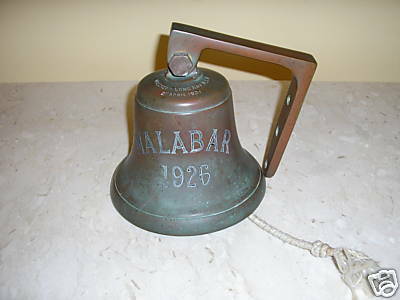 As the main prop of the Malabar was salvaged by Barry May, this prop may be from the nearby wreck of the Goolgwai or may have been cargo/spare prop. Note that this prop has changed since I first dived here in 1992. In 2004 it appears to be different and have some large rocks against it. Swim past the prop over the flat rock towards the south-west and at a distance of about 15 metres you will drop off the flat rock onto a sand bottom where you will find an enormous wheel-like structure (possibly the fly-wheel) with a shaft attached. The top of the shaft reaches to within 4.5 metres of the surface. Nearby is a cylindrical object. Turning south you will see other objects, including more davits and bollards before returning to the large driveshaft sections. After looking at this section, back track to the north and you will see the bow section, in less than four metres of water. This section has a huge pile of anchor chain piled on top of wreckage. There are some interesting things to see in this area, including huge glass sections of a skylight (wall?). There are other pieces of wreck thoughout the area, including more lifeboat davits, mast supports, bollards and other things. 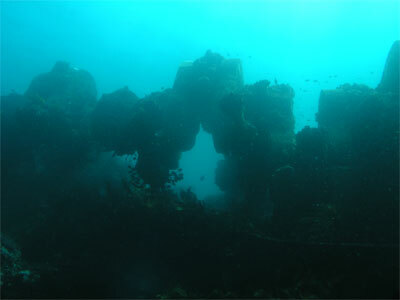 In the first year or two after the Malabar became diveable, it became a very popular dive location with up to 30 or 40 divers visiting the wreck on a fine Sunday. However, less people visit the wreck now. The dive site is regularly blessed with good visibility, with 15 metres being quite common. Not only is there the interest of the wreck for divers, the fishlife is very prolific and huge numbers of luderick, bream, yellowtail and other fish can be seen around the wreck site. The fixed marine life soon flourished and looked much healthier. Unfortunately, the kelp also grew and soon covered a lot of the smaller items, hiding them from view. On the weekends 7-8 July, 21-22 and 29-30 July 2001 Sydney had some of of the largest seas Sydney had seen for more than 20 years. On the first weekend the maximum swells recorded off Sydney were over 8 metres and on 29 July, the seas reached a huge 12 metres! On 1 August 2001 I dived the Malabar and what a change I noticed. First thing I saw once I neared the wreck area was that the kelp was much more sparse. The seas had ripped the kelp fronds off the plants and even stripped the plants from the rocks. Next thing I noticed was that the iron and steel parts of the wreck were cleared of all growth on the southern and top sides, as if a huge sandblasting machine had been at work. This will have a bad impact on the wreck, stripping the outside rust cover and exposing raw iron/steel to the ravages of the salt water. leading to even quicker corrosion of the wreck. The third thing I saw was that all the copper piping was bright and shiny, stripped of its green corrosion. The fourth thing was that the sand had been moved out of every nook and crany, exposing many small items I had never seen before. The fifth thing I noticed was the fact that many very large to huge (say 2 metre to 4 metre across rocks) had been lifted off parts of the wreck and deposited on other parts of the wreck. Finally, some parts of the wreck had been damaged by the force of the seas, most notibly the engine had cracked in the middle and many smaller steel bars and plates were moved and bent in different shapes. Since then the growth has returned (in October 2005 it covered most things) and it can sometimes be hard to ascertain what some items actually may be. The wrecking of the Malabar will forever be remembered in Sydney's history, as the suburb of Long Bay was renamed Malabar after the ship. The name was adopted sometime after the wrecking, but it was not until June 1977 that the NSW Geographical Names Board officially approved Malabar for the suburb. The name Malabar lives on not only in the of the Sydney suburb, but in this easily accessible dive for all divers. The Court found the charge proved and cancelled the Certificate of George Leslie. 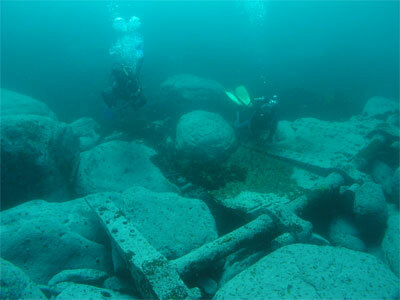 This is an interesting shipwreck and an excellent one for newer divers to start out on. It is still worth doing for more experienced divers as well. More photographs of the MV Malabar are on a separate page.